I have to admit, I was one of those people (years ago) who swore I would never use an eReader. I vowed that I would only read printed books for a bunch of reasons that I can't really remember now. I was just being stubborn. eReaders became trendy very fast. One day everyone and their grandma was reading a Kindle. It seemed like a very non-bookworm thing to do. I was proud to be a bibliophile and reading a book on a device felt sacrilegious. I remember thinking that if I bought an eReader, I would never be able to buy an actual book. How could I stop going to Barnes & Noble or the library? I couldn't. However, after a fellow book nerd showed me how handy it was and how she was actually reading more because of it, I decided to give in. I convinced myself it was mostly for school use, which we all know was an excuse. My dad bought me a Kindle for Christmas a few years back and it has become one of my most prized possessions. Now that I have had my Kindle for a couple years, I know how I feel about it now so I have devised a list of pros for each. In case you're the last living human who hasn't read on an eReader, may this list be your guide. So you know, I have the classic Kindle. It has that digital paper appearance, a keyboard and no apps or fancy backlight. I don't get a nasty glare in the sunlight, and I only have to charge it once every 3 or 4 books. I would recommend it to anyone who wants an eReader for strictly reading. So basically, I read both. I go back and forth. If it's price I'm worried about, I buy thrift store books or go to the library. Kindle books are not always cheap. You can sometimes find good deals on Amazon and of course, the old classics are free (as long as the author has been deceased for 100 years or more). I have to say there is nothing better than being able to get a sequel immediately after finishing the first book. My nightmare is that in 200 years kids are going to ask their parents, "so they used to print the whole book on paper and made a million copies for everyone?" Because yeah, to those little future kids, it sounds more economical and eco-friendly to switch over to eReaders, but you know what kids, you'll be missing out. You'll never know the feeling of hugging that big warm book to your chest, or the excitement that comes with a heavy bag of new books, or the delicious smell of a library. I don't trust that the love of reading will be carried through time without the love of books to go with it. So while I do enjoy reading my Kindle, I will never stop stacking those printed pages on my shelves. If you want to join, please link up below. 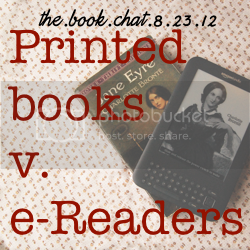 - Simply write a post pertaining to this week's topic (eReaders v. Printed books). Stretch the topic all you want. - This link up will be open all week. I agree Jessica! It was hard to make the switch to reading on a screen, but in certain circumstances it's just plain easier. I'll never give up buying printed books, but these days I do a majority of my reading on the iPad. I still love taking trips to B&N, but now I take pictures of the books I want to read & find them online when I get home. It's a brave new world out there.. I don't see me getting an e-reader anytime soon. I just hate seeing all bookstores go bankrupt. And I also often judge a book by its cover(seems to work for me! ), so I'd really miss having a tangible book. So glad I discovered your wonderful blog today... following you for sure! !